There's No Place Like Home: They Make Me Want to Paint Something! 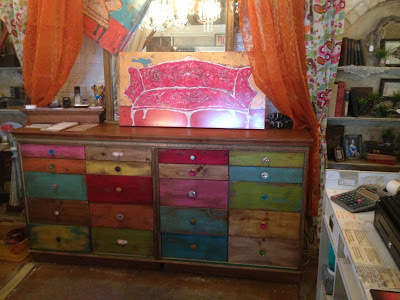 I was in Golightly's yesterday and saw the cutest piece of furniture ever, ever, ever! It's just a hutch, but Janet (the owner) painted the top like an awning. I have a thing for awnings. I especially love black and white awnings! I think it would look cute in any room of the house...my house! 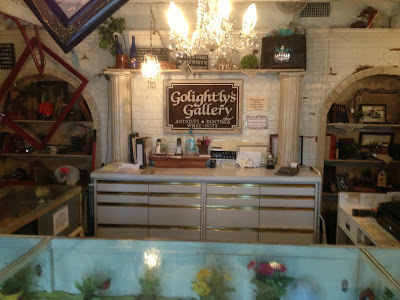 Katie LOVES to go to Golightly's too. They have lots to look at, and touch. The rule is she can touch with just one finger. So she does. EVERYTHING in the store gets the one finger touch from Katie Belle! Here she was eyeballing some treats from the bistro. Do you see those cute mini pie pops on the left? So cute! The bistro has some black and white awnings too. It just feels like Paris in there. Not that I have actually been to Paris, it just feels like what I think Paris might feel like. Ya know? One of my very favorite things is the back counter that got a makeover! It's the same piece, but new drawers were put on. And then all different knobs. I almost teared up the first time I saw it! 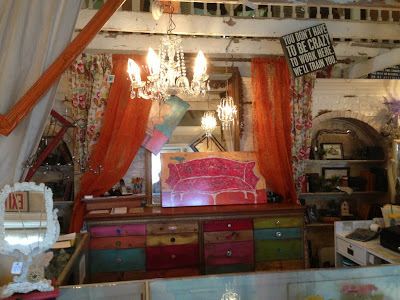 Golightly's always inspires me to do something different to my house, so I thought it might inspire you too! Haven't been in there since you and I went last summer. I think I deserve a trip out there. And this really gives me the itch to paint. I brought up painting the bedroom furniture tonight and I didn't get a crazy look, so I take that as his blessing!